One of the most common conditions seen by Workers Compensation pain management doctors is pain from spinal arthritis. Joints in the spine are called facet joints, and they are about the size of a thumbnail. 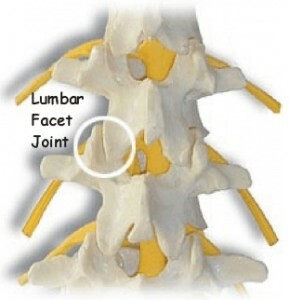 There is a facet joint located on either side of the spine at every level from the neck all the way down to the sacrum. A flare up in pain may be due to an injury sustained at work or in an auto accident. 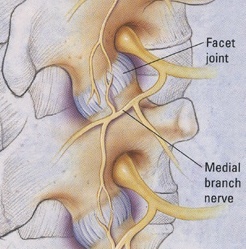 Each facet joint receives a nerve supply from the medial branches, which are tiny nerve endings to come off from nerve roots. A medial branch block involves placing numbing medicine around the medial branches. Of note, these tiny nerve endings only provide sensation and have no motor function at all. Also, these are nerve endings and not nerve roots. Medial branch block injections serve two purposes. The first is for a diagnostic purpose, where a pain doctor will perform the injection and then see how much it helps with pain relief. If substantial pain relief is achieved with a medial branch block over a particular facet joint, then that joint can be deemed to be the pain generator from arthritis. The second purpose of a medial branch block injection is for therapeutic reasons. Say-so shown that these injections, on average, provide three months of pain relief. These injections are performed as an outpatient either in a procedure room or an outpatient surgery setting. Usually, IV sedation is unnecessary, and a Phoenix workers compensation pain management doctor will simply inject numbin g medicine under the skin and threw the soft tissues down to the joint being treated. Modern injections involve the use of fluoroscopy, which is x-ray in real time that helps inshore accuracy for needle placement. Once the needle is positioned over the joint being treated, the personal injury pain doctor will inject some contrast medicine to make sure placement is appropriate. Then numbing medicine will be injected both at the top part of the joint and the bottom to make sure both medial branch nerve endings are known. Once the injection is completed, patients will be monitored for a short time to ensure stable vital signs and that no allergic reaction occurs. If the injection works for a few weeks to a few months and then wears off, the pain doctor will make a decision in conjunction with you to possibly repeat the injection.